Submitted 3 weeks 18 hours ago by feeds_user. 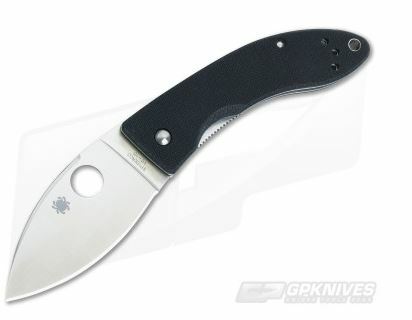 The Spyderco Lil Lum C205GP is a mini version of the legendary Bob Lum Designed Chinese Folder. At only 3.25" closed, the Mini Lum is the perfect carry companion with grippy black G10 handles and a versatile leaf-shaped stainless steel blade. More than capable for it's small size, the Lil Lum will make a great addition to your EDC rotation or valuable member to add to any Lum collection. Brand new directly from Spyderco Knives. The Blade: A great little slicer with full flat ground VG-10 stainless steel forms the identifiable leaf-shaped blade. Spyderco round hole for easy opening with either hand and upper swedge for a bit of attitude. Simple teflon washer pivot system provides for smooth opening/closing. The Handle: Dual full length skeletonized stainless steel liners offer a backbone for black textured G10 handle scales. Liner lock mechanism offers solid lock-up with simple one-hand disengagement. A slight cutout in the handle gives way to easily access the lockbar that has also been jimped for added purchase when closing. Two way tip-up polished stainless steel pocket clip and lanyard hole complete the Lil Lum.